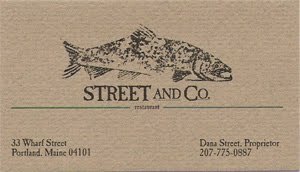 Having had such a good experience at Fore Street, the following night we went to its sister restaurant, Street and Company, just a few blocks away on cobblestoned Wharf Street. Street and Co. has a more singular mission than its sibling, with a menu focusing almost exclusively on fish and seafood dishes. 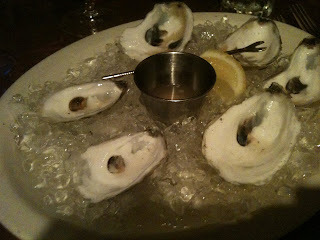 While several things we had at Street and Co. were excellent, the overall experience was somewhat more haphazard. If Fore Street's food is straightforward and honest, Street and Co. takes things even further in the direction of rusticity. Though some small "tastes" and appetizers show a little more variety, entrées are limited to a selection of seafoods simply prepared: grilled, blackened, broiled, or over pasta. Tables are all topped with brass both for decorative and practical purposes, the latter being to provide a safe landing for a number of dishes that are served right in the pan. An appetizer of beets and carrots (more of those wonderfully tasty carrots) came with some creamy, tangy, locally produced feta cheese, and dressed with a light vinaigrette. A calamari puttanesca app was a smart borrowing of flavors from the traditional pasta dish, with capers, olives and garlic in a spicy tomato sauce. My main course was a special for the evening, a blackened bluefish served in a shallow bowl of a gazpacho-style sauce. Bluefish is an oily fish that deteriorates quickly and consequently isn't often seen on many restaurant menus. This was beautifully fresh, with a coating of peppery spices that was distinct but not overwhelming, and the tangy raw tomato sauce played off it very well. It was the best of the entrées we had. The grilled whole lobster, served over a bed of linguine with garlic and butter, was tough and chewy, though in fairness I've never felt that grilling was the best method of cooking a Maine lobster anyway. More troublesome was that the pasta was literally just swimming in butter. Now I'm all for excess. And really, I'm all for butter too. But this was just too much, even for me. It didn't come off as rich or luxurious, just sloppy and unbalanced. The linguine with shrimp, butter and garlic that Frod Jr. ordered suffered the same buttery fate, though the shrimp themselves fared better than the lobster. The wine list offered a pretty wide-ranging number of seafood-friendly options at reasonable prices, though it was a López de Heredia Tondonia Rosado (1998), a grenache and tempranillo based rosé from Rioja, that really caught my eye. No silly pink wine, this well-aged specimen (the winery is known to hold wines for years, even decades, before releasing them) was complex but still lively, with an almost rusty salmon color and hints of peach, orange rind, nuts and minerals. It was too bad that the couple of pasta dishes we had were such a mess, as some other things - those oysters, the bluefish - were excellent. But next time I'm up this way, there might be a few other places I'd go to first. Normally we would try to mix things up more, but a vast majority of restaurants in Portland close on Sundays and Mondays, which happened to be the nights we were there. I had assembled a pretty long list of places I'd otherwise want to try, including Hugo's, Bresca, Caiola's, and Bar Lola. Before posting this, I was reminded that the Maine episode of Anthony Bourdain's "No Reservations" included a rather uncomfortable scene at Street and Co. I can not locate a clip, but if Bourdain described the pasta dish served in the pan as "watery spaghetti soup," I can't say I disagree.